I should probably start this review by making it clear that I don't normally blog about children's food supplements or health products for kids - worrying about the food my children eat isn't part of my Mellow Mummy mantra. In fact, as a mum who tries her very best to provide a healthy, grown-up, home-cooked diet for my two girls I strongly feel that I shouldn't NEED to supplement my baby or toddler's diet... if I do, then surely I'm getting something wrong somewhere? So, you can imagine how much of a dent in my parenting confidence it was last month when Holly was diagnosed with "Toddler Diarrhoea", a generic term used to describe persistent diarrhoea in a toddler who is otherwise healthy, and for which the GP can find no other cause. Toddler diarrhoea is commonly caused by an unbalanced gut - a tiny tummy that is still trying to cope with the challenges of an adult diet and is often seen in children who have a low-fat diet or who consume too much fruit, fruit juice or fruit squash. Ouch. That hit a nerve. Having spent almost a fortnight off work looking after Holly (because she couldn't attend nursery due to her symptoms) it felt like fate when I was contacted to review Bio-Kult Infantis. 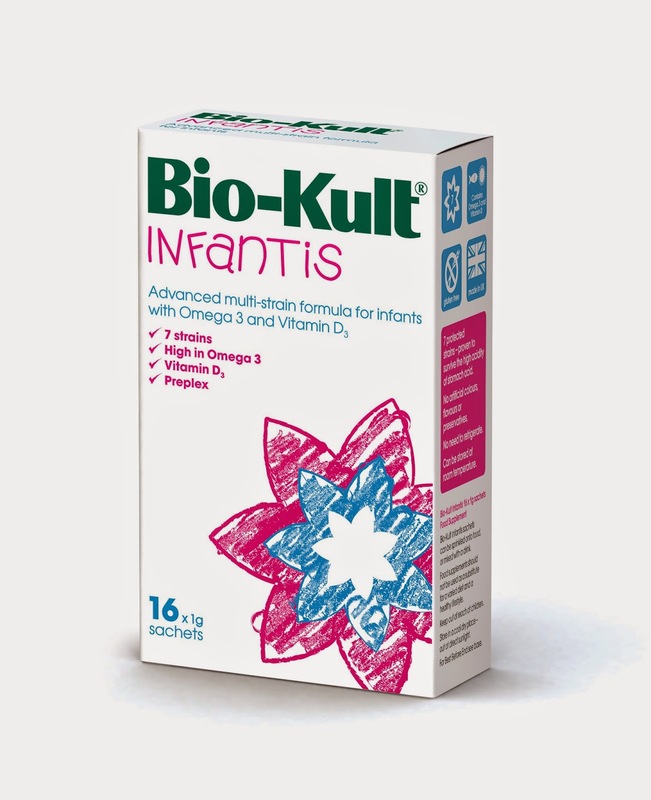 Bio-Kult Infantis is a multi-strain probiotic formula designed for infants, toddlers and young children. Given Holly's sensitive tummy, I was happy to try out Bio-Kult Infantis as an addition to Holly's normal food and drink. It comes in 1g powder sachets and, after a fascinating chat with Nutritional Therapist Natalie Lamb, I decided to start Holly on a half-sachet every day to see how she responded. You can mix Bio-Kult Infantis with milk (breast milk, formula or cow's milk), or directly with food. Each sachet contains 7 different strains of probiotic bacteria which are shown to reduce diarrhoea in gastroenteritis, improve constipation and even improve the symptoms of eczema. It also contains high levels of Omega 3 (something I'm aware we lack in our family diet) and also Vitamin D3. When I first started using Bio-Kult, I was a bit freaked out, I accidentally got some on the end of my finger and it felt funny - a bit like popping candy! I've mixed it with Holly's breakfast cereal and she has never noticed it so I assume that it mixes well! Within 48 hours of starting Holly on Bio-Kult Infantis, her loose stools cleared up. I can't tell if it is directly related, or not. I continued giving Holly a sachet each morning for a fortnight but I have since stopped again. I think I would happily start again if Holly showed any signs of an imbalanced gut again but for me, a daily probiotic isn't something I want to permanently build into her diet (as it wouldn't be for me, either). I would expect to use Bio-Kult Infantis as an occasional boost to my toddler's gut-based immune system.